Believe it or not, I am not a professional chef. The word ‘artisan’ would not be associated with my name! I am your typical ‘average Joe’ cook and baker who enjoys working in the kitchen. But, when a friend introduced me to the Average Joe Artisan Bread Kit, I suddenly believed I could bake a beautiful loaf of bread (without a handy bread machine and mix!). 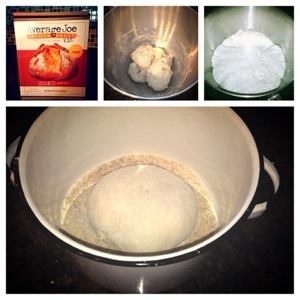 Average Joe creator Joe Bellavance perfected a very obtainable method of baking bread with his bread pot and step-by-step instructions. I will warn you, baking this bread does require time and patience, and you have to be committed to following the steps! But, trust me; you can do it, and it’s worth it! You must give yourself about 30 hours before you will eat and enjoy the bread. Day one is easy: mix the ingredients and let the dough rise for 18 – 24 hours. Day two requires your attention to detail. This is when you’ll shape the dough, let it rest one more time, then bake it! After it cools, it is then yours to devour! 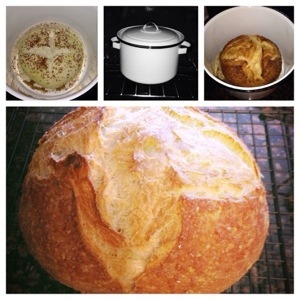 Click Here for the Average Joe Artisan Bread Kit website to learn more about the company and to shop the products. They offer a very nice gift edition that has everything you need. However, the set includes kitchenware that most of us already have, including measuring cups. In my opinion, the best option is the Cook’s Edition set with the Bread Pot. A bundle is available on the website. With this set, you’ll get the mandatory bread pot and the box that contains the instructions, recipes, and ingredients for your first few loaves. This is a great gift for the amateur baker in your life. It would be a great housewarming gift for those that you know enjoy cooking and being in the kitchen. It would also be a great addition to your kitchen if you enjoy a fun challenge, and a delicious loaf of bread for all of your hard work! The kit also includes instructions and recipes for pizza crust! That’s what I call ‘bonus’!